Impress your mobile customers with a beautiful mobile app user interface. We carefully craft your mobile application’s UI design to make it look simple, clear, functional yet attractive to the user’s eye. 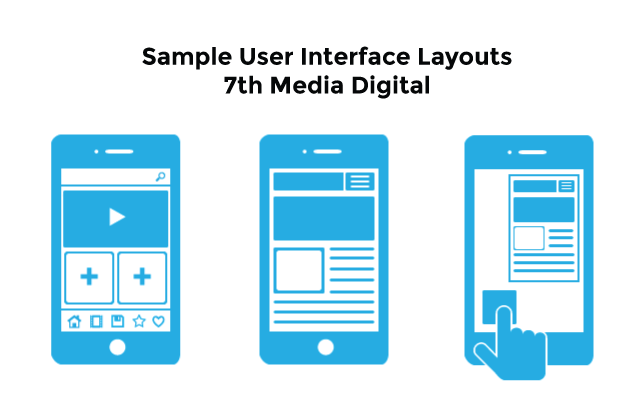 7th Media offers mobile UI design services for both iOS & Android. Enhance user experience with a UI design that communicates well with your audience. Our UI designers will create user interface designs that are relevant to the needs of your business and audience. We pay meticulous attention to typography, graphic design, navigation, pattern, menu structure, and color lighting of the app, establishing an enjoyable user browsing experience. Get an intuitive mobile user interface design. We rigorously analyse your mobile app hierarchy and position the appropriate UI elements such as containers, input controls, navigational and informational components in each of the displaying content, so the user can easily understand how to use it and can easily navigate through your mobile app. Establish a consistent brand identity in your mobile UI design and gain consumer trust. Whether it is an iOS app or Android app, our UI designers take time to study your business and analyze your target audience. We effectively craft the most applicable UI design aesthetics for your mobile app that matches your branding – from typography, color palette, functions to graphics, ensuring that your “brand message” will be consistent across any medium. Consistent branding gives your brand a better marketing recall and a stronger brand trust from your consumers. Get a mobile user interface design that can be implemented across different devices. We provide mobile UI design services for both Apple and Android phones. We believe that good collaboration with you is what makes a successful UI design. We make you involved in every UI design phase to make a full understanding of your problems, goals and strategies. We provide you wireframes, prototypes, design concepts, and style guides to ensure that we are accomplishing your vision. Looking for a UI design service provider for your mobile app?